Ever seen elephants swinging from vine to vine? 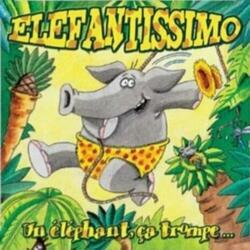 However, at Elefantissimo, that's what happens! The game takes place in the jungle, more precisely in a square composed of 36 Tree cards. Each player leads 2 elephants of his own colour. Each game turn, a player turns the Action card at the top of the deck over. The action described on the card will be successively performed by all players. There are a total of 4 different actions: remove a tree from the jungle; move a tree from the jungle; move an elephant on a nearby tree; jump an elephant past the nearby tree. Once all Action cards are turned over, they are shuffled again to form the new deck. The more trees disappear, the more difficult it is for elephants to stay in the jungle. Indeed, travel is mandatory. And in the event that an elephant cannot move or jump on a free tree (2 elephants cannot be on the same tree. Yes, yes: 1 elephant already weighs! So 2...) he falls and is eliminated. The game ends as soon as there is only one elephant color left in play. The player who owns the elephant(s) wins the game.